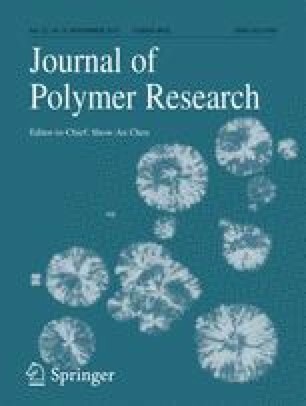 A pH-sensitive superabsorbent hydrogel composite, sodium alginate-g-poly(acrylic acid-co-acrylamide) in the presence of polyvinylpyrrolidone (PVP), was prepared using the semi-interpenetrating polymer network (semi-IPN) technique and microwave irradiation. Potassium peroxodisulfate (KPS) was used as an initiator, N,N,N′,N′-tetramethylene diamine (TEMED) as a reaction accelerator, and N,N′-methylene bisacrylamide (MBA) as a crosslinker. The Taguchi method was employed to optimize the synthetic conditions for the hydrogel based on water absorbency. The Taguchi L9 (34) orthogonal array was selected for the experimental design. The mass concentrations of MBA (C MBA), KPS (C KPS), and sodium alginate (C NaAlg) as well as the molar ratio of acrylamide to acrylic acid (R AM/AA) were chosen as the four factors in the design. Based on an analysis of variance in the test results, the optimal conditions were found to be 0.18 g/L of MBA, 0.60 g/L of KPS, 7.73 g/L of NaAlg, and R AM/AA = 1:1. The maximum water absorbency of the optimized hydrogel was found to be 1551 g/g. The relative thermal stability of the hydrogel in comparison with sodium alginate was proven using thermogravimetric analysis. The prepared hydrogel was characterized by FTIR and scanning electron microscopy (SEM). The influences of environmental parameters such as the pH and the ionic strength of the solution on the water absorbency were also investigated.